Whether it’s touring with her band Ruby Dee and the Snakehandlers or serving up a backyard barbeque, Ruby Dee always has something cooking. From the first taste of her feisty and spicy sound to the last bite of a crowd pleasing dish, Ruby Dee is making fans rave and crave her winning recipes. Touring extensively with her band of 10 years, serving up tasty rockabilly, Western swing and classic roots music has helped Ruby Dee gain a love for the many flavors that make up Americana cuisine. 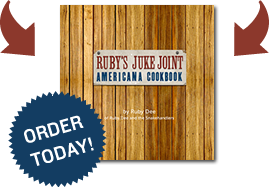 Growing up in Northern California and Texas as well as living in Alaska and South America have added to the experiences she shares in her new book “Ruby’s Juke Joint Americana Cookbook”. Ruby originally wrote out recipes and stories in this book as cognitive therapy after a devastating scooter accident left her with a brain injury. After a few months of writing however, she realized she had the makings of a book and here you have it. As a songwriter and lead vocalist, Ruby continues to write and record, including her band’s most recent release “LIVE FROM AUSTIN TEXAS’, charting for over 10 weeks on the AMA and Texas Third Coast Music charts, and earning the band a well-deserved Grammy nomination for Best Americana Album. This gal knows how to entertain and makes every interaction a veritable feast.